Mexico is the land of the master craftsman, the very first glass made in North America was produced in Puebla Mexico around 1535 to 1542 by artisans brought by the Spanish from Europe. For hundreds of years, with nothing more than a blob of molten glass, a long hollow pipe, and some old tools, these artisans have produced glass items in a variety of shapes and sizes. Although these original glass works were short lived, glass blowing was reintroduced into Mexico hundreds of years ago and flourished, due largely to the simplicity of the ingredients and the ingenuity of the Mexican Arts and Crafts Tradition. Glass blowers use a tradition over 500 years old by putting a metal pipe up to their mouth and blowing through it onto a molten glass mass heated up by an old fireplace specially made for glass blowers. 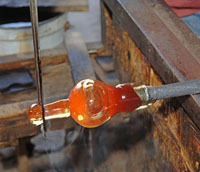 As the glass maker blows he begins to mold the piece by continuously turning it around with the pipe until it forms into a tumbler, pitcher etc. If he blows too hard the glass will fall off the tube ad he will have to start all over. To make the glasses more uniform, they sometimes use a mold for the width and the height of the glass. This way when you order them from us, they look like a set that was blown from the same Artist, because they were! As the piece begins to cool it's shaped into the style of choice, while the color is added to the rim or the entire glass in such styles as, Colored Rim, Solid Colors, Colored Splash effect, Specked, Tutti Frutti, colored band and more. Extreme temperature changes may cause the bubbles to expand which could result in a cracked glass. A short cooling off period is essential after removing the glasses from the dishwasher if the heat/dry cycle was used. Our glassware is not certified for serving hot beverages, but can be served with ice. All Mexican Glassware is 100% lead-free and dishwasher safe. Today Mexico is very well known for hand blown drinking glasses, the most popular of them characterized by a blue band blown into the rim. All glasses are 100% Lead Free. Watching the artisans at their craft is mesmerizing, the technique is truly fascinating. Originally, the glass was called "bubbles" or "bubble glass" because of all the bubbles produced when methods were not as uniform as today. Now days glass blowers that can blow large bubbles inside the glassware are considered to be "Master Blowers"
At Magellan Traders we offer only authentic, handmade and one-of-a-kind imported functional and decorative art and tableware. We have recently added some beautiful fused glass tableware from the Czech Republic in a multitude of colors which Compliments the Mexican Glass. Visit our unique Nativity scenes from around the world. Our items really are treasures -- they are unique and no two are alike. Come see our Treasures.